Archangels and Angels is offering all authors of books on magick and mystical subjects to submit them for a free book review. Just send us you books in PDF format to our normal email address. Before history began the archangels’ Michael and Gabriel successfully led God’s armies in a campaign to expel Satan and all of his evil followers from heaven. Satan’s demons have vowed revenge on God's most loved creation; Humans. Present day and Satan’s hoards have lost the spiritual war; so nearly 700 demons have adopted physical form on earth. They are wreaking havoc in an attempt to end mankind once and for all. Sgt Jim Nolan and Constable Nick Bond are the only surviving members of an elite special operations police unit that gets caught in the middle of a battle between good and evil. With an apocalyptic virus now in the hands of the anti-Christ and most of the human race dead or dying, the angelic battle has moved to earth. 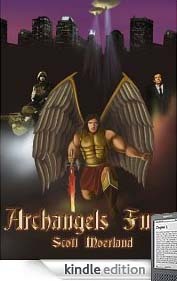 The archangels are the dangerous warriors ever created. Unfortunately they are drastically outnumbered and face an impossible task against the anti-Christs demons and the offspring of fallen angels; The Nephilim. We have not had the opportunity to review this book personally. Please use the Amazon Book Review comments accessed via the link to book below. This book is not a factual book but a work of fiction.